The Physical Education department is a committed, friendly and highly motivated department whose mission it is to engage pupils in a challenging yet safe environment. Physical activity should be part of everyone’s lifestyle and by sampling different sports throughout their time at the Academy, we hope to inspire pupils to carry on with physical activity beyond school. The department comprises of a several state of the art facilities, including an all-weather 4G AstroTurf, a sports hall, dance studio, gymnastics studio, fitness Suite and tennis courts. In addition we have outdoor basketball hoops, outdoor table tennis tables and a rugby field. The department is well resourced with a wide range of specialist equipment. It also has a range of technological resources including an indoor cricket bowling machine and interactive white boards in the gymnastics and dance studios. Skill and motor skills development. Provides regular, healthful physical activity. 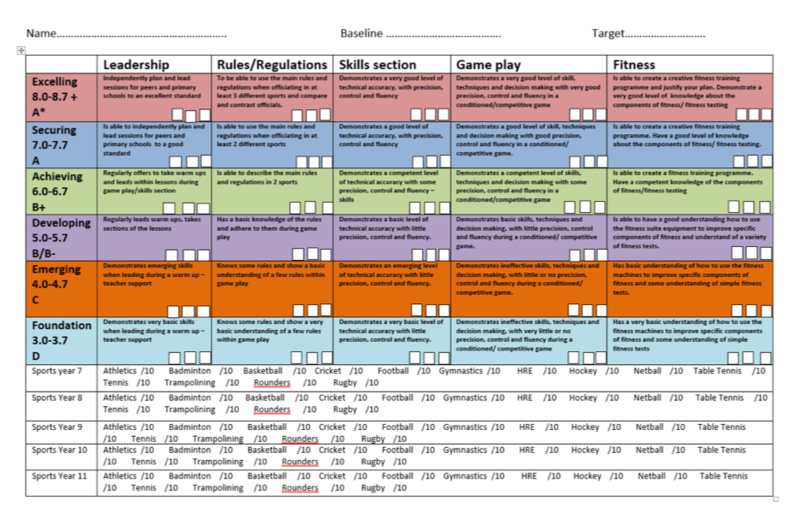 In Year 7, 8 and 9 students study a range of activities where they are assessed in different aspects of Physical Education throughout the year. In Key Stage 4, students are completing BTEC level 2 First for Sport courses and Edexcel GCSE Physical Education. BTEC Firsts are vocationally-related qualifications designed to develop learners’ knowledge and understanding through the application of learning and skills in a work-related context. BTEC Firsts are designed to allow learners to progress to other level 2 qualifications or apprenticeships, to junior roles in the industry they are learning about or level 3 qualifications. The BTEC Firsts in Sport have been developed to give learners a stimulating and engaging introduction into the world of sport. Learners can gain knowledge, skills and understanding through practical participation and performance in a range of sports, exercise, and health-related fitness activities. This allows students to become familiar with the language, skills and processes required to work in the sport and leisure industry. The BTEC philosophy of ‘learning through doing’ remains at the heart of this qualification. Learners are given the opportunity to gain a broad understanding and knowledge of skills in sport. There are four components: Component 1 and Component 2 are assessed via two written papers, Component 3 and Component 4 form the NEA.